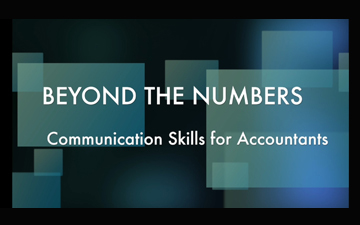 WELCOME to "Beyond the Numbers: Communication Skills for Accountants," by Bonnie Gross of SpeechScience. Bonnie is your host for this new video blog to help Canadian accountants learn key communication and speaking skills that will add value to and rapidly advance your career as a Chartered Professional Accountant. In the first of this ongoing series, Bonnie focuses on communication and presentation techniques for CPA networking, in a five-week video called "Secrets of Confident Conversation." As Bonnie says, "What could come between you and another CPA with the same skills [for] that promotion or a major client-facing position is not necessarily the answer that you think." And don't forget: Bonnie also provides an online courses through CPA Ontario.